How’s that for journalistic responsibility? Shots included in this story are of a stretcher with someone’s foot protruding from under a blanket, and the front of the “mangled” (in the words of Ms. Preskey) SUV. While she goes on to say that “initial information” is that there are no life-threatening injuries. Way to wait for solid information, folks. If I sound pretty ticked about this, it’s because this isn’t the first time I’ve witnessed this kind of irresponsibility by KXMB (or posted about it). My last post on the matter got me threats of a lawsuit from Darrell Dorgan last year, by the way. Regardless, I stand firm in my stance that this kind of reporting is unnecessary and unprofessional. How would you like to catch a news story about one of your loved ones on TV like this? Since my original post I’ve been contacted by others with similar horror stories of seeing loved ones in media. It isn’t a trivial matter. While turning on my TV just now I caught the tail end of a KFYR-TV story on this same accident. Apparently their cameras were there, too. But did they run to get it on the air before details were known? I see their website has a story on this (with a shot taken from a distance) with a timestamp of 4:35pm. That means KFYR probably had their story on their 5 o’clock news. The KFYR story has details including the speed of both vehicles, the extent of injuries, and the fact that the payloader involved was travelling legally. In other words, they WAITED. By the way, I’m not railing on KXMB because I worked for KFYR-TV for all those years. 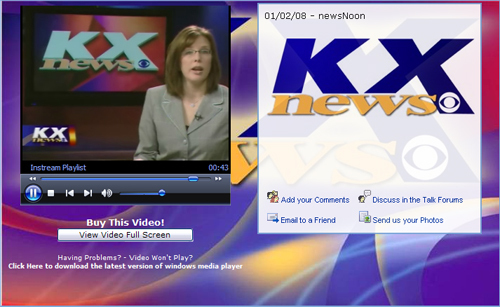 When I watch local news, I watch KXMB. The nature of KFYR’s four-station setup means they have to focus on regional news and don’t go into much detail on local Bismarck-Mandan stories. I love Kevin and LT, tho. I will say that when I was at KFYR, we had written policy against sensationalism. Maybe I can find my old employee manual and send that page to KXMB for inspiration. Look, folks…we’re in DMA number 158…that’s pretty much the hind end of television. There’s no need to rush to sensationalism just to say “we’re first!” Show a little responsibility. Dashing from accident scene to air doesn’t do your stations or your viewers any favors. Think of the victims’ families…please?